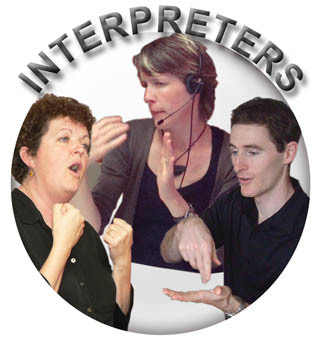 Sign Language Interpreters – To Provide or Not to Provide? Shortly after the 20th anniversary of the Americans with Disabilities Act in July of 2010, Ocean wrote a letter to the Editor of the Evansville Courier and Press, which was printed in the paper a few days later. As a result, she was asked to to write a series of articles about accessibility for the deaf and hard of hearing, to be posted on the city’s blog. The below is the first of such articles, in which she shares her views on the provision of sign language interpreters. Back in 1989, I served on an advisory committee to offer my expertise in the drafting of a bill which would help to improve the lives of persons with disabilities here in the United States. A year later, I joined with my colleagues in celebrating the passage of the Americans with Disabilities Act on July 26, 1990. As a Deaf person and an Advocate, I was pleased to see the law become reality. But twenty years later, I’m forced to wonder how effective the ADA has truly been. A lot of people are still unaware of this law, and even those who have heard of it often are still in noncompliance with it. This noncompliance especially seems to impact on the deaf and hard of hearing community, whose communication needs frequently go ignored. Part of the problem stems from a lack of full understanding about those communication needs, and how to best go about meeting them. For many Deaf people, communication means sign language, and sign language means interpreters – a service many people know little about and most balk at having to provide. Contrary to popular opinion, the Americans with Disabilities Act does not mandate that sign language interpreters must be hired when dealing with Deaf people. What it does mandate is that auxiliary aids and services must be provided to assure effective communication. Such aids and services can include the provision of sign language interpreters. So this begs the question…when are interpreters required? This is not an easy question. The answer is…it depends. There’s just no easy cut-and-dried solution. Every individual will be different, every situation will be different, and every communication need will be different. The result being that every solution will be different. What works for me might not work for my friend Joe Deaf. What works for me today for my one-on-one meeting with my attorney might not work next week when I have to go into the courtroom and stand before a judge and jury. Every situation has to be evaluated on a case-by-case basis, and discussed with the deaf or hard of hearing individual to determine what the needs are and how to assure that effective communication is indeed taking place. 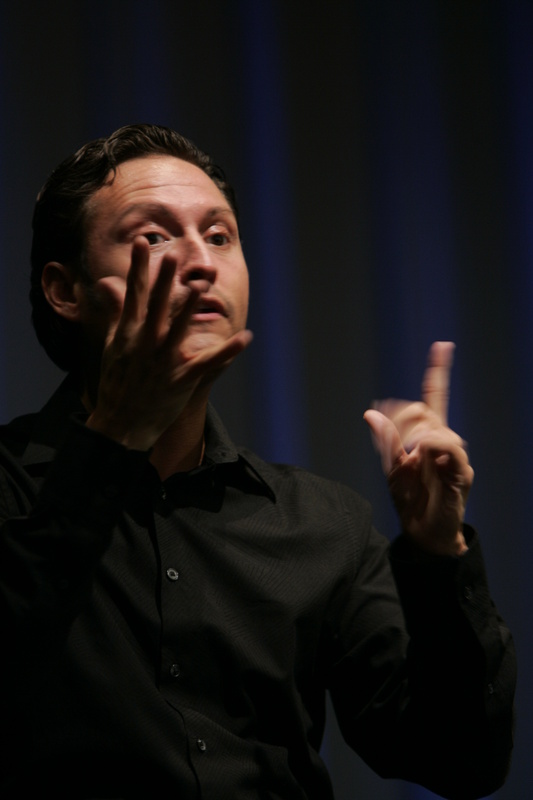 And yes…in some cases that effective communication does require providing a qualified sign language interpreter. Not all people with hearing loss know sign language or use interpreters. But if American Sign Language is indeed their primary language and/or communication mode, most likely the deaf person will request an interpreter. If the individual does in fact request a sign language interpreter, your best bet is to honor that request. Most people with disabilities are the experts on what their needs are. Don’t presume that you know better than they do. Most likely you will be wrong, and you’ll be opening yourself up to the potential of a lawsuit… which will probably cost thousands of dollars more than the original interpreting request did. Yet in spite of this fact, every year the Department of Justice and/or the National Association for the Deaf’s Law and Advocacy Center (not to mention local deaf agencies all around the country) receive hundreds if not thousands of complaints from Deaf individuals regarding the denial of interpreting services. Such refusals are spread across the board – from employers to city/state government offices to courtrooms to hospitals to businesses to nonprofit agencies…all of which are covered under the Americans with Disabilities Act. All of which are supposed to be in compliance with the law, but which after twenty years, the majority still have yet to develop a policy or procedure on how to secure and provide interpreting services. One area of frustration I have noticed when doing research on the issue of providing interpreters and assuring effective communication is the limited information pertaining to such on the internet, which often tends to only discuss specific topics related to providing interpreters and touch on certain areas regarding the “effective communication” mandate. For example, much of the information I’ve found tends to focus on Title III, which relates to Public Accommodations – a private entity that owns, operates, leases, or leases to, a place of public accommodation. Places of public accommodation include a wide range of entities, such as restaurants, hotels, theaters, doctors’ and lawyers’ offices, banks, pharmacies, retail stores, auto dealerships, museums, libraries, parks, private schools, and day care centers. I suspect this focus on Title III is because the greatest numbers of complaints or lawsuits filed are in fact against public accommodations. However, the problem is equally if not more prevalent amongst employers. We just don’t learn about it as often. Especially in today’s economy with its high unemployment rate, Deaf people may not want to make waves in the workplace…so they suffer in silence even as their civil rights go unmet. The result is that they end up being denied interpreters (and thus effective communication), and the employers get away with noncompliance. As a general rule, if a person needs an auxiliary aid or service in order to assure effective communication, they need to request such in advance (although some types of aids and services should be readily available – such as captioning of videos and other media, visual means of providing information given via audio announcements, visual alert systems, etc.) If I need a sign language interpreter, I have to say so and request such from the employer, public accommodation, or public/governmental entity. This can become problematic, because it forces Deaf individuals such as myself to become clairvoyants, able to predict that on such and such a day I am going to need interpreting services at such and such a place at such and such a time. Thus we have to plan our life and schedule accordingly, and pray we don’t get the 24-hour bug twelve hours beforehand. It reduces the option of last minute planning or the level of spontaneity. This “must request in advance” requirement can become a real sore spot when a Deaf person wants to participate in an open public event that s/he may have just learned about earlier than same day. An example could be an open “free to the public” theatrical performance in the park, or an open public meeting. This is a challenging issue, and I’m not sure it can be resolved all that easily. As I understand it, the Department of Justice basically states that each situation must be evaluated on a case-by-case basis, for various reasons such as those explained above. I imagine that from a legal perspective, DOJ needs to say “the services have to be requested.” The rationale for this would be fairly simple… the Department and others who have to take on these complaints of discrimination can’t build a case if they can’t show that the services were denied (or were not effective). And they can’t prove denial if the services were not requested in the first place. As I said…there doesn’t appear to be an easy answer. This is the type of situation where everyone is kinda caught between a rock and a hard place. Nevertheless, this doesn’t mean that we can’t all have our own views on the whole interpreter issue and our own opinions on such matters. In my humble opinion, if you’re holding a public meeting where there is reasonable cause for believing that Deaf individuals may attend – such as a disability meeting, budget cuts for a program which serves deaf/hoh people, or something along similar lines, you would be wise to go ahead and schedule an interpreter. In some cities, all governmental meetings open to the public are automatically interpreted – Deaf people present or not. Admittedly, one has to wonder if that’s still the case, considering the current economy. It’s a harsh fact that when money is tight, providing accommodations tends to go out the window. Granted, providing an interpreter is no guarantee that a Deaf person will show up…but at least the entity has still covered all bases and assured that the meeting is accessible. One can look at it this way – installing ramps and accessible bathrooms is no guarantee a wheelchair user will show up either. Bear in mind that ADA does not cover the federal government or federal funding – that’s covered under Section 504 of The Rehabilitation Act of 1973 (almost twice as old as the ADA). This law does not pertain merely to the federal government itself… but also to federal financial assistance. Thus if an organization receives federal dollars, including Medicare or grants from a federal agency (such as the Department of Education, Department of Labor, Department of Justice or Department of Health and Human Services), then you have to make your programs and services accessible to persons with disabilities. If an employer receives a federal contract to build equipment for the federal government, then that employer has to provide reasonable accommodations – not just under ADA, but under Section 504. If a city government receives a federal grant to fund a program to provide services for its population…then it must comply with Section 504 in employment, public meetings and hearings, and program/service provision. This includes the provision of auxiliary aids and services to assure effective communication. Well, nobody requested one, so we didn’t bother to schedule an interpreter. We can communicate just fine via writing notes. Ohhh yeah…I just love writing the Great American Novel on my nausea, diarrhea, fever and night sweats in the doctor’s office. How many times have we experienced employers, public entities, or public accommodations trying to argue that the client can understand just fine without a sign language interpreter… while we sit there blankly, wondering what the heck is going on and what these folks are jabbering about. The truth is…neither 504 nor the ADA are effective laws for the Deaf Community. It’s one thing to build wheelchair ramps and accessible bathrooms which will always be there when you need them…whether you request such or not. It’s a whole different ballgame to have to contract to hire interpreters to assure effective communication. That’s the problem – these laws were written as disability laws… not as language access laws. Deaf people don’t really see themselves as being disabled so much as being culturally different, including the utilization of a separate language. Deaf people have more in common with the foreigner from Vietnam who only speaks Hmong than with the wheelchair user who has cerebral palsy, or the war veteran with traumatic brain injury. It’s not that we can’t be sympathetic to the issues of access faced by persons with disabilities…we can and we are. But our perspectives are different, and our needs are different. And getting those needs met often proves to be a bigger challenge than it ought to be.